...one of the worst things about civilization is, that anybody that gits a letter with trouble in it comes and tells you all about it and makes you feel bad, and the newspapers fetches you the troubles of everybody all over the world, and keeps you downhearted and dismal most all the time, and it's such a heavy load for a person. There is no suffering comparable with that which a private person feels when he is for the first time pilloried in print. A private should preserve a respectful attitude toward his superiors, and should seldom or never proceed so far as to offer suggestions to his general in the field. By the etiquette of war, it is permitted to none below the rank of newspaper correspondent to dictate to the general in the field. The devil's aversion to holy water is a light matter compared with a despot's dread of a newspaper that laughs. - "The American Press," first printed in Mark Twain: Press Critic, University of California, 2003. 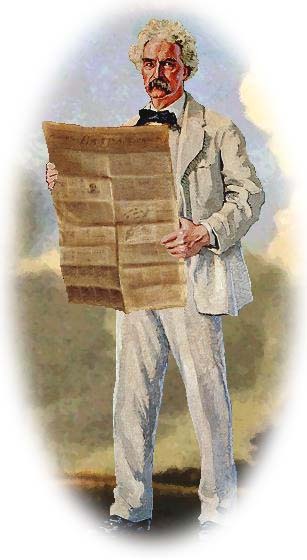 I am personally acquainted with hundreds of journalists, and the opinion of the majority of them would not be worth tuppence in private, but when they speak in print it is the newspaper that is talking (the pygmy scribe is not visible) and then their utterances shake the community like the thunders of prophecy. 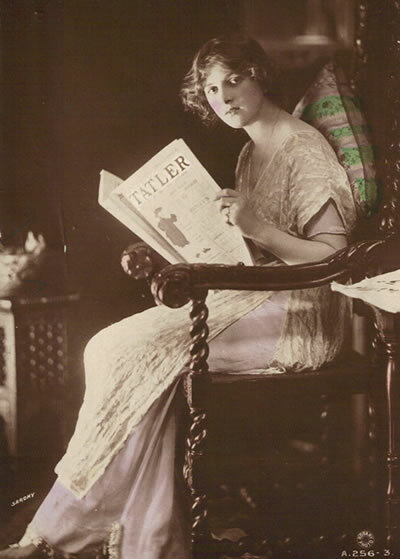 We are also told that our newspapers are irreverent, coarse, vulgar, and ribald. I hope that this irreverence will last for ever; that we shall always show irreverence for royalties and titled creatures born into privilege, and all that class which take their title from anything but merit. - Interview, "Mark Twain and His Book," Pall Mall Gazette (London), 23 December 1889. We like to read about rich people in the newspapers; the papers know it, and they do their best to keep this appetite liberally fed. The old saw says, "Let sleeping dogs lie." Right. Still when there is much at stake it is better to get a newspaper to do it. ...news is history in its first and best form, its vivid and fascinating form, and...history is the pale and tranquil reflection of it. It has become a sarcastic proverb that a thing must be true if you saw it in a newspaper. That is the opinion intelligent people have of that lying vehicle in a nutshell. But the trouble is that the stupid people -- who constitute the grand overwhelming majority of this and all other nations -- do believe and are moulded and convinced by what they get out of a newspaper, and there is where the harm lies. Unassailable certainty is the thing that gives a newspaper the firmest and most valuable reputation. Our papers have one peculiarity -- it is American -- their irreverence . . . They are irreverent toward pretty much everything, but where they laugh one good king to death, they laugh a thousand cruel and infamous shams and superstitions into the grave, and the account is squared. Irreverence is the champion of liberty and its only sure defense. Necessarily we are all fond of murders, scandals, swindles, robberies, explosions, collisions, and all such things, when we know the people, and when they are neighbors and friends, but when they are strangers we do not get any great pleasure out of them, as a rule. Now the trouble with an American paper is that it has no discrimination; it rakes the whole earth for blood and garbage, and the result is that you are daily overfed and suffer a surfeit. By habit you stow this much every day, but you come by and by to take no vital interest in it -- indeed, you almost get tired of it. As a rule, forty-nine-fiftieths of it concerns strangers only -- people away off yonder, a thousand miles, two miles, ten thousand miles from where you are. Why, when you come to think of it, who cares what becomes of those people? I would not give the assassination of one personal friend for a whole massacre of those others. And to my mind, one relative or neighbor mixed up in a scandal is more interesting than a whole Sodom and Gomorrah of outlanders gone rotten. Give me the home product every time. - "Italian Without a Master"